Reflexão Reformada: BIBLIOGRAFIA SUGERIDA PARA ACADÊMICOS E ESTUDANTES DE TEOLOGIA EVANGÉLICOS. BIBLIOGRAFIA SUGERIDA PARA ACADÊMICOS E ESTUDANTES DE TEOLOGIA EVANGÉLICOS. Eis alguns livros em inglês que podem ser de grande auxílio para acadêmicos e estudantes de teologia evangélicos. 1. Evangelical Theology: A Biblical and Systematic Introduction (Michael Bird). 2. The Christian Faith: A Systematic Theology for Pilgrims on the Way by Michael S. Horton. 3. A New Systematic Theology of the Christian Faith: 2nd Edition - Revised and Updated by Robert L. Reymond. 4. Christ, Our Righteousness: Paul's Theology of Justification (New Studies in Biblical Theology) by Mark A. Seifrid. 5. Justification and Variegated Nomism: The Complexities of Second Temple Judaism (Wissenschaftliche Untersuchungen... by D. A. Carson, Peter T. O'Brien and Mark A. Seifrid (Aug 2001). 6. Perspectives on Our Struggle with Sin: Three Views of Romans 7 by Terry L. Wilder, Chad Brand, Shephen Chester and Grant R. Osborne (Nov 1, 2011). 7. HISTORY OF THE REFORMATION IN THE SIXTEENTH CENTURY (All 20 Volumes In 1 Complete Book) (HISTORY OF THE REFORMATION... by J. H. MERLE D'AUBIGNÉ, H. WHITE and HENRY BEVERIDGE (Feb 16, 2014). 8. Contending for the Faith: Lines in the sand that strengthen the Church, by Robert L. Reymond. 9. Systematic Theology (Douglas Kelly) (Two Volume Set). 10. Concise Reformed Dogmatics by J. Van Genderen. 11. A History of Christian Doctrine, 2 Volumes: by William G.T., D.D. Shedd. 12. Dogmatic Theology, 3 Volume Hardback Complete and Unabridged Set by William G. T. Shedd. 13. The Reformed Doctrine of Predestination by Loraine Boettner. 14. Calvin and the Reformed Tradition: On the Work of Christ and the Order of Salvation by Richard A. Muller. 15. Three Views on the Rapture: Pretribulation, Prewrath, or Posttribulation (Counterpoints: Bible and Theology) by Alan Hultberg, Craig A. Blaising, Douglas J. Moo and Stanley N. Gundry. 16. The Epistle to the Romans (New International Commentary on the New Testament) by Douglas J. Moo. 17. The Letter to the Hebrews (Pillar New Testament Commentary) by Peter T. O'Brien. 18. The Letter to the Ephesians (Pillar New Testament Commentary) by Peter T. O'Brien. 19. The Epistle to the Philippians (New International Greek Testament Com (Eerdmans)) by Peter T. O'Brien. 20. Word Biblical Commentary Vol. 44, Colossians-Philemon by Peter T. O'Brien. 21. The Reformation Theologians: An Introduction to Theology in the Early Modern Period by Carter Lindberg. 22. Martin Bucer's Doctrine of Justification: Reformation Theology and Early Modern Irenicism (Oxford Studies in Historical... by Brian Lugioyo. 23. History of the Christian Church, 8 vols. by Philip Schaff. 24. Nicene and Post-Nicene Fathers: Second Series (The Early Church Fathers, Second Series , So14). 25. The Ante-Nicene Fathers (10 Volume Set). 26. Creeds of Christendom : 3 Volumes by Philip Schaff. 27. Luke (Baker Exegetical Commentary on the New Testament) (2 Volumes) by Darrell L. Bock. 28. Matthew (Zondervan Exegetical Commentary on the New Testament) by Clinton E. Arnold and Grant R. Osborne (Oct 23, 2010). 29. Romans (Baker Exegetical Commentary on the New Testament) by Thomas R. Schreiner. 30. 1-2 Thessalonians (Baker Exegetical Commentary on the New Testament) by Jeffrey A. D. Weima, Robert Yarbrough and Robert Stein. 31. The Book of Revelation (The New International Greek Testament Commentary) by G. K. Beale. 32. The Temple and the Church's Mission: A Biblical Theology of the Dwelling Place of God (New Studies in Biblical... by G. K. Beale. 33. 1-2 Thessalonians (The Ivp New Testament Commentary Series) by G. K. Beale. 34. The Use of Daniel in Jewish Apocalyptic Literature and in the Revelation of St. John: by G. K. Beale. 35. God Is Love: A Biblical and Systematic Theology by Gerald Bray. 36. Systematic Theology 3 Vol. Set by Thomas C. Oden. 37. Salvation Belongs to the Lord: An Introduction to Systematic Theology by John M. Frame. 38. Introduction to Systematic Theology: Prolegomena and the Doctrines of Revelation, Scripture, and God by Cornelius Van Til and William Edgar. 39. The Book of Psalms (New International Commentary on the Old Testament (NICOT)) by Nancy deClaiss-Walford, Rolf A. Jacobson and Beth LaNeel Tanner. 40. New Testament Theology: Magnifying God in Christ by Thomas R. Schreiner. 41. A New Testament Biblical Theology: The Unfolding of the Old Testament in the New by G. K. Beale. 42. King in His Beauty, The: A Biblical Theology of the Old and New Testaments by Thomas R. Schreiner. 43. The Plan of Salvation by B. B. Warfield. 44. Works of Benjamin B. Warfield, The by Benjamin Breckinridge Warfield. 45. Biblical Words and Their Meaning by Moises Silva. 46. God, Language and Scripture by Moises Silva. 47. Philippians (Baker Exegetical Commentary on the New Testament) by Moisés Silva. 48. The Gospel according to Mark (Pillar New Testament Commentary) by James R. Edwards. 50. The Letters to the Colossians and to Philemon (Pillar New Testament Commentary) by Douglas J. Moo. 51. The Letters to the Thessalonians (Pillar New Testament Commentary) by Gene L. Green. 52. The Acts of the Apostles (Pillar New Testament Commentary) by David G. Peterson. 53. Mark 9-16: A Handbook on the Greek Text (Baylor Handbook on the Greek New Testament) by Rodney J. Decker (Nov 1, 2014). 54. Mark 1-8: A Handbook on the Greek Text (Baylor Handbook on the Greek New Testament) by Rodney J. Decker (Nov 1, 2014). 55. Acts (Baker Exegetical Commentary on the New Testament) by Darrell L. Bock. 56. The Final Days of Jesus: The Most Important Week of the Most Important Person Who Ever Lived by Andreas J. Köstenberger, Justin Taylor and Alexander Stewart. 57. Invitation to Biblical Interpretation: Exploring the Hermeneutical Triad of History, Literature, and Theology... by Andreas J. Köstenberger and Richard Patterson. 58. The Expositor’s Bible Commentary (EBC) (12 vols.). 59. John (Baker Exegetical Commentary on the New Testament) by Andreas J. Köstenberger. 60. Women in the Church: An Analysis and Application of 1 Timothy 2:9-15 by Andreas J. Köstenberger and Thomas R. Schreiner. 61. Father, Son and Spirit: The Trinity and John's Gospel (New Studies in Biblical Theology) by Andreas J. Kostenberger and Scott R. Swain. 62. A Greek-English Lexicon of the New Testament and Other Early Christian Literature, 3rd Edition by Walter Bauer and Frederick William Danker. 63. Theological Dictionary of the New Testament 10-vol set by Gerhard Kittel and Gerhard Friedrich. 64. The Book of Isaiah, Chapters 40–66 (New International Commentary on the Old Testament) by John N. Oswalt. 65. The Book of Isaiah, Chapters 1–39 (New International Commentary on the Old Testament) by John N. Oswalt. 66. The Five Points of Calvinism: Defined, Defended, and Documented by David N. Steele, Curtis C. Thomas and S. Lance Quinn. 67. Debating Calvinism: Five Points, Two Views by Dave Hunt and James White. 68. Calvinism: A History by D. G. Hart. 69. From Judaism to Calvinism: The Life and Writings of Immanuel Tremellius (C. 1510-1580). 70. By Faith, Not By Sight: Paul and the Order of Salvation (2d. Ed.) by Richard B. Gaffin Jr.
71. Resurrection and Redemption: A Study in Paul's Soteriology by Richard B. Gaffin Jr.
72. Christianity's Dangerous Idea: The Protestant Revolution--A History from the Sixteenth Century to the Twenty-First... by Alister McGrath. 73. Reformed Dogmatics (5 vols.) by Vos, Geerhardus, Gaffin, Richard B., Jr., de Witt, Richard Lexham Press. 74. A Dictionary of the Bible (5 vols.) by Hastings, James. 75. The Works of Jonathan Edwards (2 vols.) by Jonathan Edwards. 76. A History of the Reformation on the Continent (3 vols.) by George Waddington. 77. Reformed Expository Commentary (18 vols.). 78. An Old Testament Theology by Waltke, Bruce K., Yu, Charles. 79. Early Church Fathers Protestant Edition (37 vols.). 80. Post-Reformation Reformed Dogmatics (4 vols.) by Richard Muller. 81. Christian Theology by Benedict Pictet. 82. Works of François Gaussen (5 vols.). 83. A System of Christian Theology (10 vols.) by Amandus Polanus. 84. Select Works on Reformed Symbolics (14 vols.). 85. Select Works on the Westminster Assembly (32 vols.). 86. J. J. van Oosterzee Theological Studies Collection (8 vols.) by J. J. van Oosterzee. 87. Herman Ridderbos Collection (7 vols.) by Herman N. Ridderbos. 88. Reformation Trust Collection (35 vols.). 89. New Schaff-Herzog Encyclopedia of Religious Knowledge (13 vols.) by Samuel Macauley Jackson. 90. Studies in Dogmatics (14 vols.) by G. C. Berkouwer. 91. Historical Theology (2 vols.) by William Cunningham. 92. The Reformed Doctrine of Predestination by Loraine Boettner. 93. Classic Studies on the Atonement (32 vols.). 94. 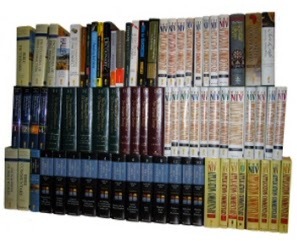 Zondervan Bible Reference Bundle 3 (63 vols.). 95. Paul, Apostle of God's Glory in Christ: A Pauline Theology by Thomas R. Schreiner. 96. 40 Questions About Christians and Biblical Law (40 Questions & Answers Series) by Thomas Schreiner and Benjamin Merkle. 97. Galatians (Zondervan Exegetical Commentary on the New Testament) by Thomas R. Schreiner and Clinton E. Arnold. 98. Believer's Baptism: Sign of the New Covenant in Christ (New American Commentary Studies in Bible & Theology) by Dr. Thomas R. Schreiner Ph.D. and Shawn Wright. 99. Systematic Theology 3 Vol. Set by Thomas C. Oden. 100. Still Sovereign: Contemporary Perspectives on Election, Foreknowledge, and Grace by Thomas R. Schreiner and Bruce A. Ware.1. From Heaven He Came and Sought Her: Definite Atonement in Historical, Biblical, Theological, and Pastoral Perspective by David Gibson. 101. Calvin & the Calvinists by Paul Helm. 102. Calvin by F. Bruce Gordon. 103. Calvin and the Reformed Tradition: On the Work of Christ and the Order of Salvation by Richard A. Muller. 104. An Old Testament Theology: An Exegetical, Canonical, and Thematic Approach by Bruce K. Waltke and Charles Yu. 105. Old Testament Theology: Reading the Hebrew Bible as Christian Scripture by R. W. L. Moberly. 106. Theology of the Old Testament: Testimony, Dispute, Advocacy by Walter Brueggemann. 107. Theological Interpretation of the Old Testament: A Book-by-Book Survey by Kevin J. Vanhoozer, Craig Bartholomew and Daniel Treier. 108. Theological Wordbook of the Old Testament by R Laird Harris, Gleason L Archer Jr. and Bruce K Waltke. 109. Three Views on the New Testament Use of the Old Testament (Counterpoints: Bible and Theology) by Kenneth Berding, Jonathan Lunde, Stanley N. Gundry and Walter C. Kaiser Jr.
110. Themes in Old Testament Theology by William A. Dyrness. 111. The Ten Commandments: A Short History of an Ancient Text by Michael Coogan. 112. A Concise Hebrew and Aramaic Lexicon of the Old Testament by William L. Holladay. 113. The Ancient Hebrew Lexicon of the Bible by Jeff A. Benner. 114. Gesenius' Hebrew and Chaldee Lexicon to the Old Testament Scriptures: Numerically Coded to Strong's Exhaustive... by H. W. F. Gesenius and Samuel Prideaux Tregelles. 115. Biblical Hermeneutics: Five Views (Spectrum Multiview Books) by Stanley E. Porter Jr. and Beth M. Stovell. 116. Introduction to Biblical Interpretation, Revised Edition by William W. Klein, Craig L. Blomberg and Robert I. Hubbard Jr..
117. Biblical Hermeneutics by Gerhard Maier and Robert W. Yarbrough. 118. Gospel-Centered Hermeneutics: Foundations and Principles of Evangelical Biblical Interpretation by Graeme Goldsworthy. 119. Invitation to Biblical Interpretation: Exploring the Hermeneutical Triad of History, Literature, and Theology... by Andreas J. Köstenberger and Richard Patterson. 120. The Future of Biblical Interpretation: Responsible Plurality in Biblical Hermeneutics by Stanley E. Porter Jr. and Matthew R. Malcolm. 121. Hermeneutics, Authority, and Canon: by D. A. Carson. 122. Biblical Interpretation and Philosophical Hermeneutics by B. H. McLean. 123. How We Got the New Testament: Text, Transmission, Translation (Acadia Studies in Bible and Theology) by Stanley E. Porter, Craig Evans and Lee McDonald. 124. Hermeneutics: An Introduction to Interpretive Theory by Stanley E. Porter and Jason C. Robinson. 125. New International Commentary on the Old Testament (set of 24 volumes) by Robert L. Hubbard. 126. Word Biblical Commentary (WBC) (59 vols.). 127. New International Commentary on the NEW Testament (18 Volume Set) by Gordon D. Fee.